A rhombus is formed by two radii and two chords of a circle of diameter 20 units. What is the area of the rhombus? Ok I know i should provide a solution for this but my main problem is visualizing the problem in the first place. 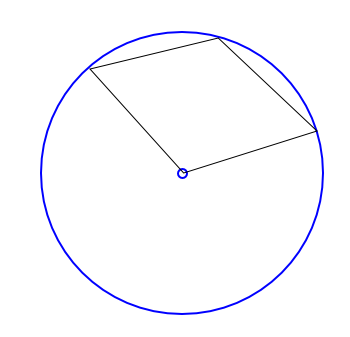 I really really don't see how two circles can form a rhombus? May I have some help drawing this? My diagram is a little crooked. Remember that the four sides of a rhombus are always equal in length, and the radii of a circle are all equal in length. Find length of transverse common tangent of two circles touching externally, intercepted by a third circle touching both circles externally. Area of a region delimited by chords and circular arcs.